No matter how many times I sit in a space that is reflecting on, learning from or critiquing issues around gender, I am always both pleased and flummoxed by the range of perspectives in the room, with some people gasping at the idea that gender is and always has been a spectrum and other people strongly affirming the importance of LGBTIQA inclusion in all spaces including, in this case, on the internet. APC invited me to participate in this year’s African School on Internet Governance (AfriSIG), which took place in Zanzibar, less than 100 metres from the warm waters of the Indian Ocean. From the first day to the last, it became evident that AfriSIG is a place for deep learning about the infrastructure and mechanics behind the internet, but also about policy and governance issues, ranging from how domains are structured and registered to the geopolitical dynamics within national, regional and international internet governance spaces. I spent the first three days frantically swimming in acronym soup – ccTLDs and DNSSEC, ICANN and DDoS, words that I had never heard before. As it turns out, the internet is not simply this magical thing that some people have access to and others do not. In fact, the politics and mechanics behind internet access in Africa are a complex maze of histories and varied realities. By the third day of AfriSIG, once I had learned how to paddle head-above-water in very technical conversations, I could finally agree with Avri Doria, who expressed that the internet is indeed an entity unto itself or, as she put it, sui generis. Getting a behind-the-scenes look at the internet and meeting women and men from across Africa working to make the internet in their communities faster, easier to access and more affordable made it seem like a more human space in many ways. For nearly twelve years, I have busied myself with the politics of spaces (including the internet) and how or if women, girls and LGBTIQA people are allowed into and represented on them. I immediately count the number of women and men in any room I walk into and listen carefully to who speaks and what they say. I come into spaces armed with ideas, facts and words that position me clearly as a feminist, a social justice champion and someone who blatantly takes the side of women and LGBTIQA people in discussions or debates. But here, at least for the first few days, I was a fish out of water. Very early into the school, I was advised to allow myself to think and experience the space outside my comfort zone and, more than anything, be open to learning. While I tried my best to do this, I often struggled with questions of class, race, gender and sexuality, and wanted to understand where these issues intersect when it comes to conversations about, for example, who gets to decide where fibre cable is laid or whether it is okay for a company or country to own a domain name. For two days before the beginning of AfriSIG, I attended a workshop hosted by the Internet Society’s Collaborative Governance Project, which aimed to build skills in conflict resolution and negotiation theory and practice in the context of multi-party/stakeholder processes. This was an interesting (and sometimes shocking) exercise in trust. Trying to trust that other people have your best interests at heart was not always easy, and this lack of trust became more evident as we participated in the AfriSIG practicum. It soon became clear that building trust and coming to a consensus in multistakeholder processes takes time and effort, especially while working with people who hold very different kinds of power and influence. The issue of trust emerged once again when Chenai Chair and I facilitated a conversation about gender and internet governance. The first “cat among the pigeons” was creating room for the idea that gender is a spectrum and not a binary. This was not easy, because such a revelation often brings with it a very personal confrontation with a singular and lifelong idea of what gender is. That gender is a social construct and we are taught to be either girls or boys, that the reinforcing of a static idea of culture keeps the power scales consistently tipped in favour of men, and that this very personal idea of gender directly influences internet governance was a lot to share in one space. I imagine that it was also a lot to take in. In addition to this, it was crucial to highlight LGBTIQA people, who are consistently underrepresented (and in many places entirely invisible) as an important part of the gender and sexuality spectrum. Central to this conversation about gender was the issue of power – who has it and who does not, and how it influences not only the representation of women and LGBTIQA people on the internet, but also how and if they have access to internet or get to be involved in digital governance and structuring. This was the second cat among the pigeons. The third cat was the mention of the Feminist Principles of the Internet, which pricked the rapidly inflating balloon of mistrust in the room. “Feminist is a dirty word”, “It immediately alienates men” and “We need a softer approach if we want to encourage men to participate” are all things that I have heard many times, but in this space, it was possible to try to trust that people were asking questions because they wished to learn. Often, when women speak about the need for equal access and opportunities in every space, from our bedrooms to our, yes, our internet, people do not trust that this call for equal access will benefit everyone. This is especially present in many African countries that are still grappling with economic and social colonialism, now disguised as neoliberalism and capitalism. We never seem to have enough, and we grow up being taught that we must scramble and fight for very limited resources and power in everything from our personal lives to our communities and countries. The premise that power cannot be shared is prevalent, more so when women seek to occupy as much space and power as men do in the world. Where both traditional and popular culture have time and again positioned women and LGBTIQA people as the “other”, the internet offers a powerful opportunity to shift this. After our session on gender and internet governance, I was asked multiple times by AfriSIG fellows, “But seriously, what does gender really have to do with the Internet?” The answer is: everything. And changing the pervasive dynamics in these spaces is not about gender representation in the traditional sense, where a minimum effort is made to ensure that women are present in a way that does not disrupt the existing balance of power. In the rush to show that women are taking up space, we have ended up creating room for women only as tokens – present but not presenting, listening but not speaking. This is still evident on the internet, with comparatively very little content created, shared and owned by women in Africa. Even online, African women are at the tail end of one of the most powerful and transformative spaces at the moment. What this means is that power structures that benefit one particular group over another remain unchallenged, which has implications for many if not all social justice concerns such as race, class, sexuality and gender. The internet has become intertwined with our daily lives in every way, and if we do not insist, request and demand that we, people living in the margins of a capitalist, heterosexist system are given space and power, the same kind of oppressions that are felt outside the internet will manifest within it. Despite the polarising nature of the conversation, there were moments, much later, after the discomfort of some of the fellows had settled, when people said to me, “I didn’t know that gender was a spectrum. I have never seen or heard that before. Or that gender is taught to us as children. That’s something I have never heard before, either.” This was affirming and exciting, to think that people will continue to sit with this conversation and hopefully start to be more aware not only of their own power, but also the power and positioning of those around them, in the office or mutistakeholder spaces, and what this means for internet governance. I have been spoiled and very privileged to interact in queer and feminist spaces where I did not have to explain again and again why it is important for women and LGBTIQA people to take up room and space. Facilitating this session at AfriSIG taught me not to take for granted that there are still many people who have never been confronted with ideas that challenge and contradict their lifelong beliefs about how the world is or should be. Thankfully, because of thousands of African feminists who claim space online and create content that disrupts such normative narratives that forever seek to keep women and men in stereotyped boxes, I no longer have to do the emotional labour of explaining and validating my presence as a queer woman in an internet governance space or anywhere else in the world. I can share links to articles, I can find videos, I can allow other women and LGBTIQA people that are fortunate enough to access and contribute to the internet to do this work for me. I have the internet to thank for this, and this is another reason why gender, and all kinds of genders and sexualities, have everything to do with the internet. 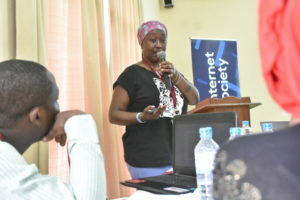 Sheena Gimase Magenya is the All Women Count-Take Back The Tech! project coordinator at the Association for Progressive Communications. The project is interested in shifting, challenging and disrupting discourses that normalise online gender-based violence in Kenya, Egypt and India. 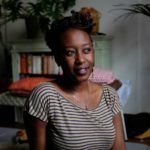 Sheena has a background in media and communications, and is interested in the opportunities that African women have to influence and effect change in social and political spaces, including online spaces. She is curious about technology and the Internet, and passionate about an intersectional feminist approach to social justice.